Playing catch up on this news! Some time ago Cineplex announced changes coming to their very popular SCENE program. These changes will take place on April 17, the day after Starbucks' changes, so that will be the week of change! But in reality what this does mean, is all your current balances, if not used prior to April 17 are being devalued. Your 1,000 points that you thought would get you a movie will not after that date. You'll have to spend at 250 more points or more if you are going for the fancier movie settings. Other devaluation comes in the food and drinks at the movies and to the credit card. Concession Combos will now earn more points and remain the same on the redeeming side but it is when you buy non-combos where you will take the hit. The earn rate is being cut in half from 10 points per $1 to 5 points per $1 however it will still take 500 points to get $5 off those items. 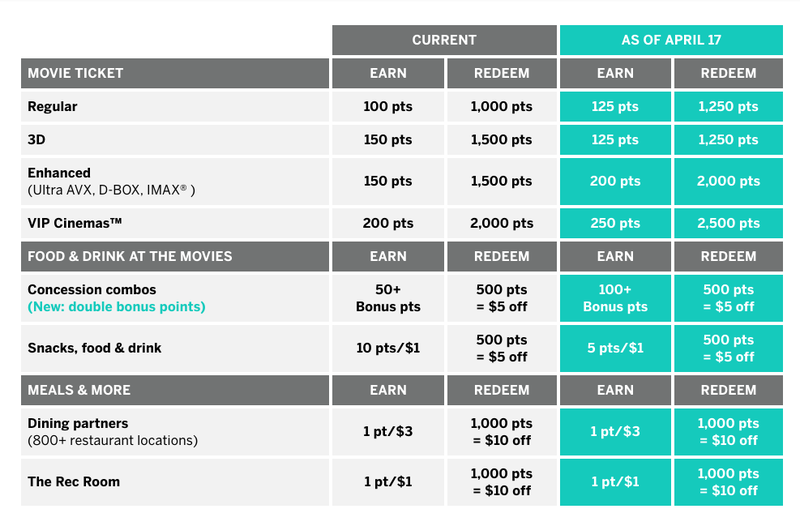 Outside of Cineplex movie and food options the earn and redemption rates at their dining partners (Cara group of restaurants and The Rec Room) will remain the same. As is seen with most loyalty programs, most points that are issued are from co-branded credit cards and I believe this to be the same for the SCENE program. People spend lots on their cards and hold onto big balances of points. So how do you get rid of all those points that have been accumulated and hoarded? Make it cost more points to redeem for items. This to me stands out to be the main reason for the upcoming changes. I could be wrong, I hope I am but time after time this tends to be the case. Hey though, it's not all bad news, 3D movies have gotten cheaper now but really how many 3D movies are out there these days? Learn more about the Cineplex SCENE changes here. What are all your thoughts on the changes? Did we miss anything? Will you be keeping the SCENE Visa Card? Let us know in the comments section below!